Watch My Garden Grow: A cucumber has appeared! As stated in an earlier post, I have learned a lot of patience with vegetable gardening. I wrote a cucumber haiku about 2 1/2 weeks ago. The little flower was patiently waiting for the bee. The bee finally came to my plot! 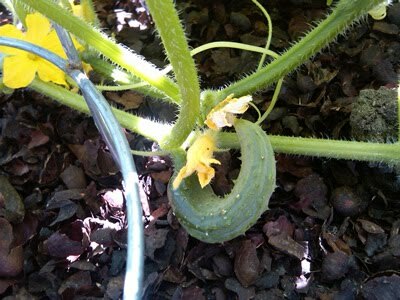 There is one little cucumber starting to grow. It took a little over 8 weeks for the little cucumber to sprout from the flower. Two months of watering and weeding and talking to the plant. I wonder how many cucumbers will be harvested from this one plant in my plot?